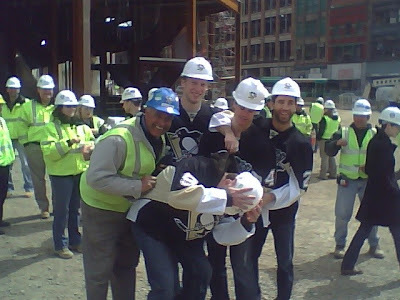 Reader Jon sends over this pic, shot today, featuring Jordan Staal, Pascal Dupuis, Tyler Kennedy and Max "Superstar" Talbot donning hardhats and visiting the site of the Penguins' new arena. 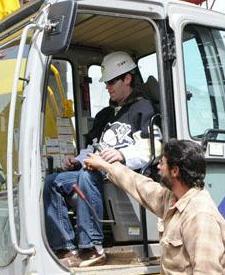 Does Dan Bylsma know some of his key guys are moonlighting in the construction industry during their down time? UPDATE: The Pens' website has a full story on the event, which included free pizza, autographs, and a lot of goodwill. The Penguins have to have the best PR staff around. From having players deliver season tickets, to having playoff games shown on an outside TV monitor, and now having players mingle with the new arena construction crew, it gives such a good impression of the franchise. I am sure that Puck Daddy would find a way to turn this into a story about Sidney Crosby not being there because he was too busy whining and diving.